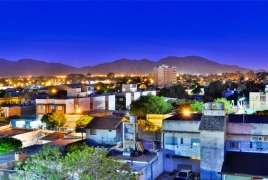 The province of San Luis, Argentina, approved on Tuesday, November 21 a law of adhesion of the National Law 26,199 that declares April 24 of every year as the "Day of Action for Tolerance and Respect between Peoples" in commemoration of the Armenian Genocide, becoming the twentieth province to do so, Agencia Prensa Armenia reports. The Chamber of Senators of San Luis voted unanimously for the formal recognition of the Armenian Genocide and adhered to "the acts and events for memory and claim of the Armenian community" and undertook to "promote actions of commemoration at the provincial level", according to the approved project. "This adhesion of the Senate legislators takes place in the context of the 10 years of the promulgation of the National Law and the declaration of the Parlasur," said Nicolas Sabuncuyan, director of the Armenian National Committee of Argentina. "It ratifies the consensus that exists at a regional, national and federal level regarding one of the main issues of the Armenian Cause, and will be the platform for a closer work with the representatives of the people of San Luis, especially in the field of education and the memory transmission." Article 4 of Law 26,199, enacted on December 13 2006 and promulgated on 11 January 2007, invites provincial governments to "adhere to the provisions". The provinces that have already joined the National Law are Buenos Aires, the Autonomous City of Buenos Aires, Catamarca, Chaco, Chubut, Córdoba, Corrientes, Entre Rios, Jujuy, La Pampa, La Rioja, Mendoza, Misiones, Neuquen, Rio Black, Salta, San Luis, San Juan, Santa Cruz, Santa Fe and Tierra del Fuego. The provinces of Santiago del Estero, Formosa and Tucuman have not yet adhered to the national recognition.